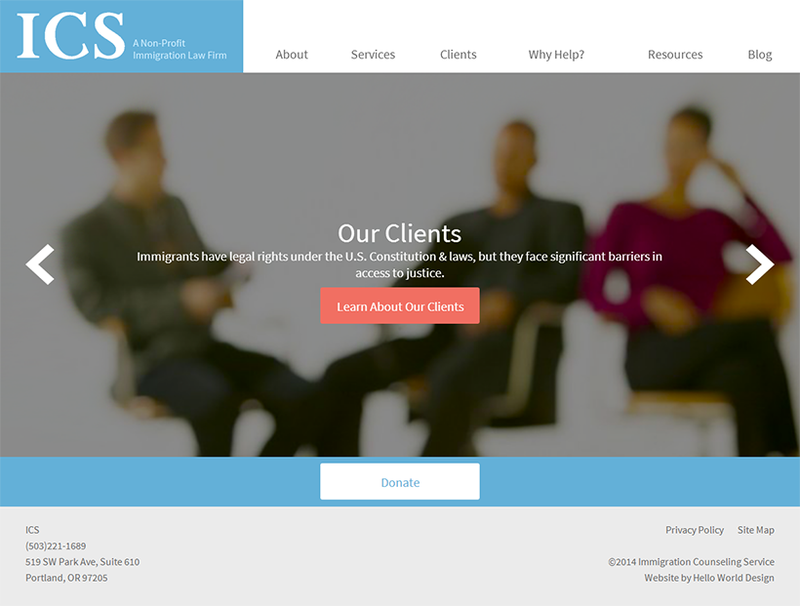 Hello World Design has officially launched a newly redesigned, custom website for Immigration Counseling Service (ICS), a Portland-based non-profit immigration law firm. Since 1978, ICS has been serving the Oregon immigrant communities by providing legal services to persons of low income seeking to flee persecution, families separated by borders applying for reunification and individuals who are striving to become United States citizens. Hello World Design redesigned ics-law.org to give the site a professional, warm look that better reflects the work the firm does. A new top navigation bar makes it quick and easy to find more information on the firm's clients and services, resources on immigration and the firm's newly launched blog, keeping people up to date on ICS news and immigration related issues. The new homepage layout is user-friendly and has made it easier than ever to donate to ICS's Children's Legal Fund, a fund dedicated to helping Unaccompanied Children in Oregon to be reunited with family members or sponsors, in addition to other services. The new site also features a fully responsive design, so it works on all browsers and across all web-enabled mobile devices and tablets.